So, I’ve blogged about natural lifestyle, and now I’d like to say a little about natural feeding. I feel that this is a two pronged subject, the obvious point being what food goes in, but firstly I want to talk about how the horse takes in the aforementioned food. We all know that horses are designed to graze for 17 or so hours out of every 24. They are designed to mainly eat with their heads down, with occasional browsing higher up on trees and bushes. I am always perplexed by the use of haynets (and I was a user of them in the ‘traditional’ way myself – more on that in a minute), and wonder how the inventor of them thought they were a suitable method of providing hay. It’s a classic human convenience instead of it being for the horses benefit. I cringe when I think back at my use of a wall mounted hay rack for Misty, a pony who we would later discover has COPD (or RAO as it is now known). It wasn’t even at head height, but above, so the poor girl had to reach up and most likely suffer the dust etc. dropping down. Thankfully they seem to have mostly fallen out of fashion. In dressage, and riding in general, we strive to have the horse muscled correctly over it’s topline. 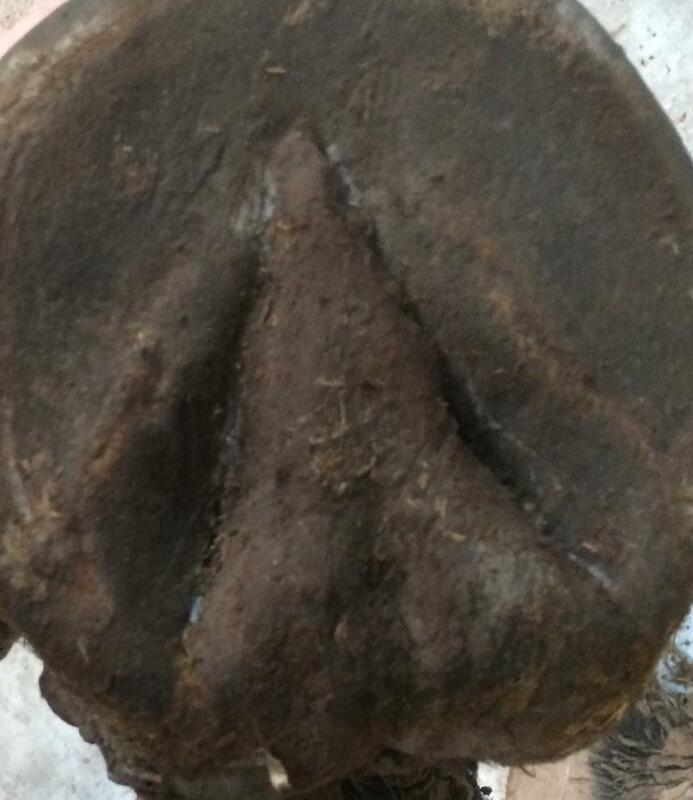 A muscled underneck is not ideal, yet this is the muscle the horse is working when pulling hay upwards from a net. Apart from that, I can’t imagine it’s terribly comfortable doing that hour after hour. Eating at ground level stretches the topline, a relaxing action. It ensures correct alignment on the top and bottom jaws, which in turn, aligns the teeth for correct wear. Lastly it allows the sinus and guttural pouch to drain effectively. However the haynet isn’t necessarily the bad guy. An idea shamelessly stolen from a barefoot Facebook group, last year we started feeding our a haynets on the ground. Now don’t panic, I know we’re breaking all the BHS rules but hear me out. 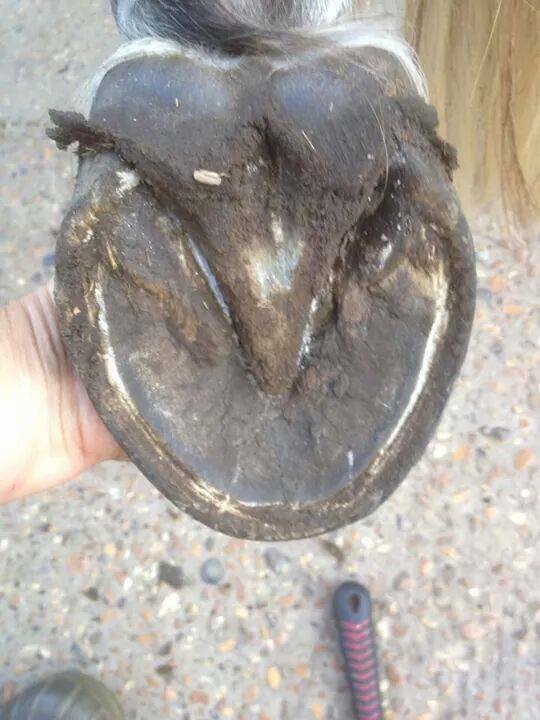 I cannot stress enough that this is only really suitable for barefoot horses, otherwise there is a risk of getting the net caught between the shoe and hoof. It is also important to use haynets with as small holes as possible, we use 2″ as anything larger isn’t going to be safe. We fill the net, pull it tightly closed, then daisy chain the rope and tuck it back in the net. The horses love it, I’m happy seeing them eating with their heads down, we’re wasting less hay than we would if we placed the hay directly on the ground, it’s slowing them down, and they’re enjoying working a little harder for their hay rather than just eating it like spaghetti. ‘Hooves up’ from the girls! Would love to know your thoughts on our unusual use of haynets! Have you come up with any different uses for horse items? This entry was posted in Horse care, Lifestyle and tagged barefoot, feeding, ground feeding, hay, haynets, Horse care, native pony, natural horse on February 12, 2016 by Emma. So, a little more about this whole natural lifestyle I’m always raving about. Why is it so important to me and so important to the horses? Maybe I’ve just been lucky over the years, but having native ponies, that is, ponies bred in the UK for their hardiness and versatility, it’s just happened naturally. As such, any subsequent horses (even though they will likely have a large proportion, if not all Welsh blood) will surely gravitate towards that lifestyle. Horses, being nomadic creatures, wish to roam vast distances in search of food and water. They require the company and security of their own kind. Modern horses often live a life far removed from their not-too distant, wild cousins. Small paddocks for turnout (if any) often pristine and free from ‘weeds’ with just one or two types of grass on the menu. It does frustrate me when I see such pristine lawns. For an animal which is designed to graze for 17 or so hours per day, how dull it must be to have only one or two grasses on which to browse. Nettles? Thistles? Docks? Why they are weeds, unsightly, and must be exterminated! Humans have a perfect, flat, green field which pleases us, but can’t be stimulating for the horses. We are lucky at our livery yard. In summer there are all manner of ‘weeds’ growing. Nettles around the edges, dandelions dotted about, chamomile by the gate, comfrey down by the river and a few milk thistles every now an then. It is a joy to watch the horses browsing and clearly enjoying the variety. 24/7 turnout is also something I feel quite strongly about. I know a lot of people who do stable their horses at night, and I appreciate they have various reasons for doing do, however personally I would aim for none of mine to be. I realise I have an advantage as such, given that the herd are all natives and better equipped to deal with whatever the British weather throws at them. I just feel that we humans anthropomophise horses too much. Horses are happy to spend their time grazing, wandering about the field, playing etc. and sleep for about 4 hours in 24, not consecutively, but in small ‘cat naps’. Do any of you keep your horses naturally? Leave a message in the comments. This entry was posted in Horse care, Lifestyle and tagged 24/7 turnout, barefoot, grazing, herbs for horses, horse, horse lifestyle, horses living out, native pony, natural horse, pony on January 21, 2016 by Emma. After a 2 month competition break, we dragged the bog pony from her mud pit, brushed her off, gave her a haircut and hacked to Bluegate. I think Saf might have forgotten all about being a dressage pony, and we’d also hardly done any hacking, so she was a bit surprised when we arrived. 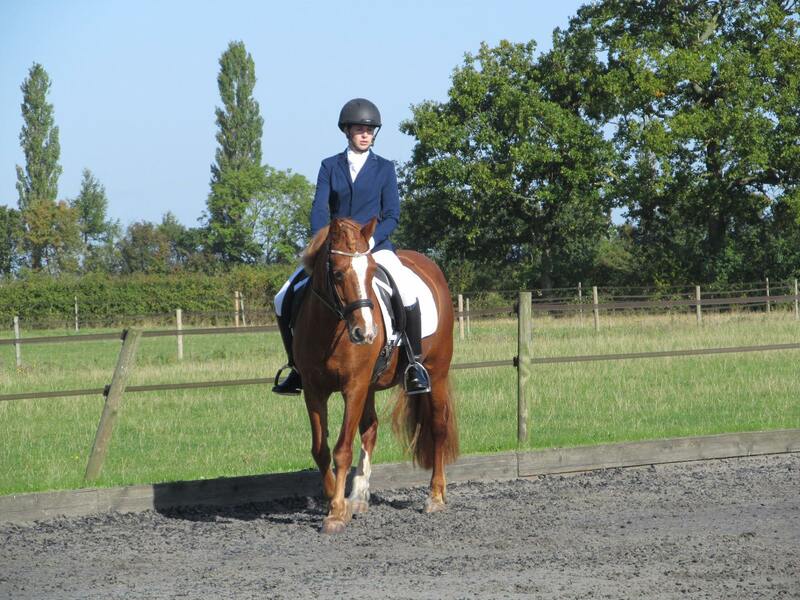 A lot of tension from both horse and rider, but with Claire’s brilliant help in the warm up, we managed to calm down. Even though I felt calm myself, when we got to the long arena for the test, the tension came back in Saf. She managed to keep it under wraps, it felt the best in ages, plus it was my beloved Prelim 17 test! I was enjoying the feeling of having time to think, and was confident about the next movement so could actually plan ahead – a first for me! We seem to have well and truly slain our ‘incorrect bend gremlin’. I was really pleased with both trot circles, and even enjoyed the canters, actually managing a single half halt during the canter to slow Saf (it worked – just need to work a few more in now!) Loved the final centre line and halt (got a lovely 7 for that). 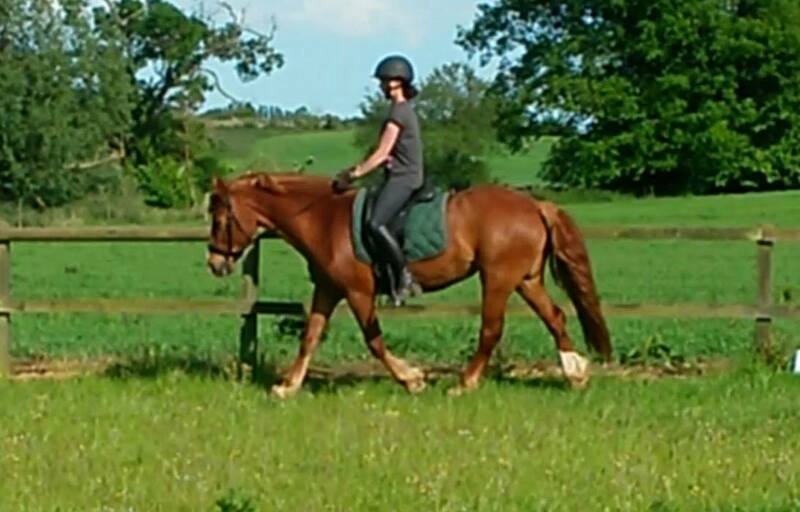 I did have a bit of a ninja grip on the reins, before the bell rang and asked for a trot transition and Saf decided to sod off at high speed, so wasn’t too keen on giving too much rein after that. 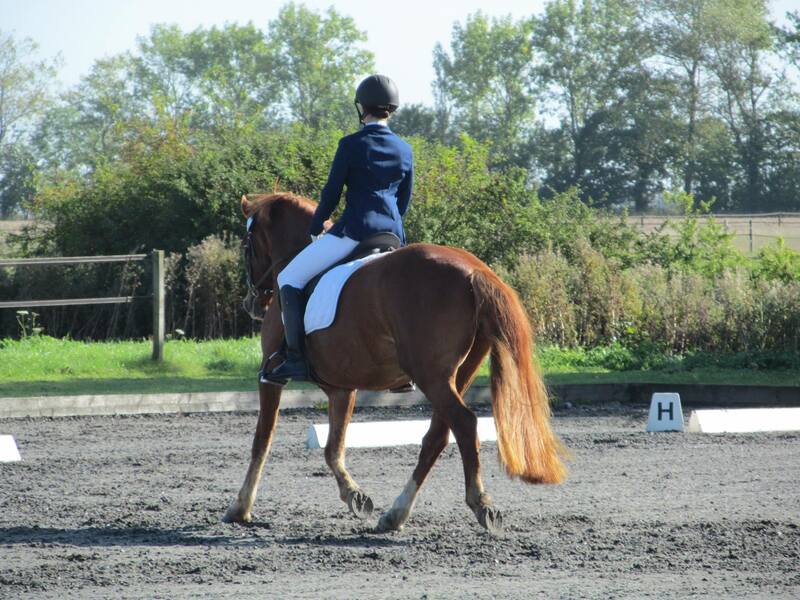 Things to work on: longer rein for next time and remember my elbows! Finished with 61.53%, really pleased with that, so nice to claw our way into the 60’s. We’re going verrry slowly but it’s so nice to see a bit of progress. We’re now more consistently getting 6.5’s for our trot work and 6’s for our canter work, as opposed to 5’s and 5.5’s previously. Canter feels a million times more controllable now. Not entirely sure whether we’ll do any more this year, it really depends on how the weather goes, but if it is our last one this year, a really nice test to finish on. 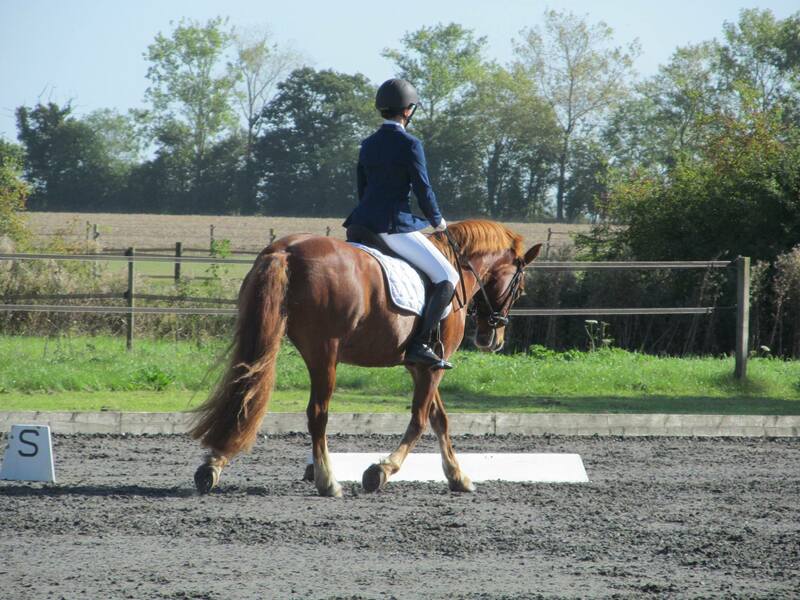 This entry was posted in Competitions and tagged barefoot, bending, british dressage, circles, classical, competition, contact, dressage, equestrian, hacking, photos, pony, prelim 17, riding on September 29, 2015 by Emma. We’re starting to make preparations for winter (eek!) so lots of tidying of the lower field and generally catching up on jobs that have built up over the summer. We’re going to smarten ourselves up and head to Bluegate on 26th Sept, 1.5 months of no competitions means Saf has reverted to a rather feral appearance! 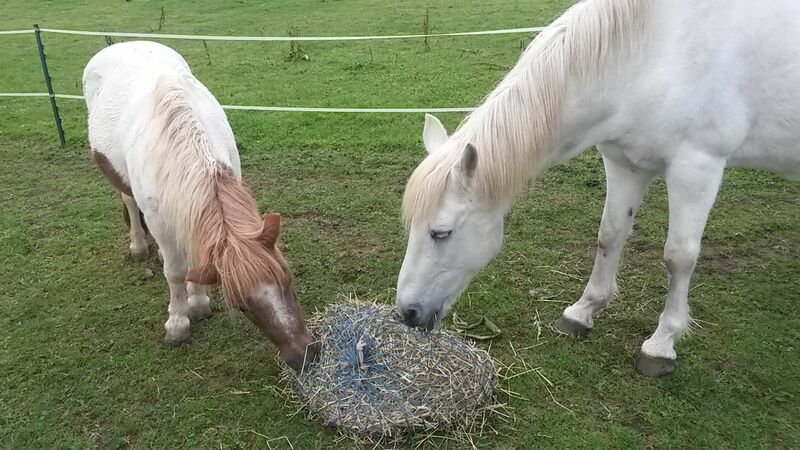 Here’s a nice pic of Mist and Rosie this morning sharing their hay – cute! 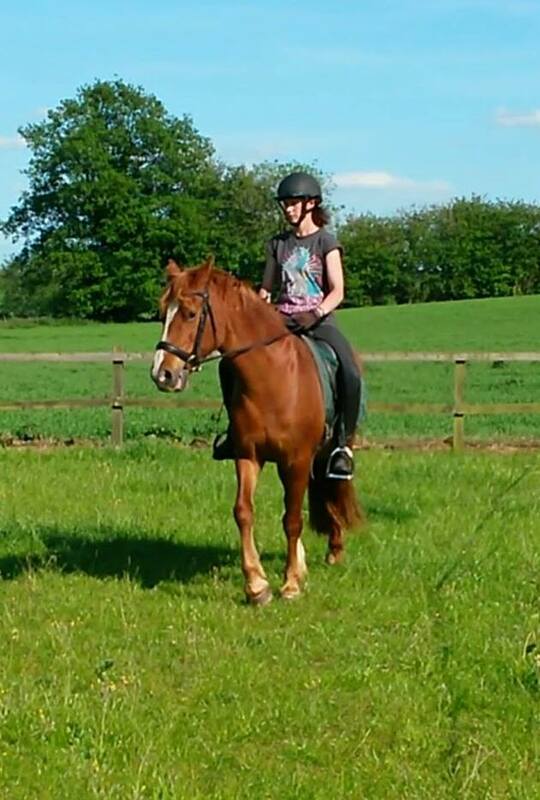 This entry was posted in Horse care, Lifestyle and tagged barefoot, care on September 15, 2015 by Emma. 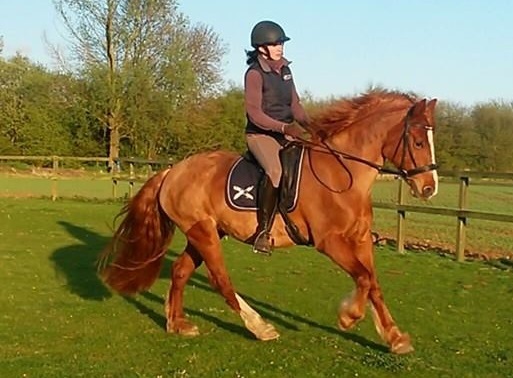 This blog sits under the banner ‘Dragon Dressage’ which is a bit of fun really, I train my Welsh Cob and my sister Claire, and my partner Andrew work as a support / advisory team. Normally Claire and I both post on our facebook page (Claire is currently without a ride but is window-shopping) but to be straightforward, just I write this blog. 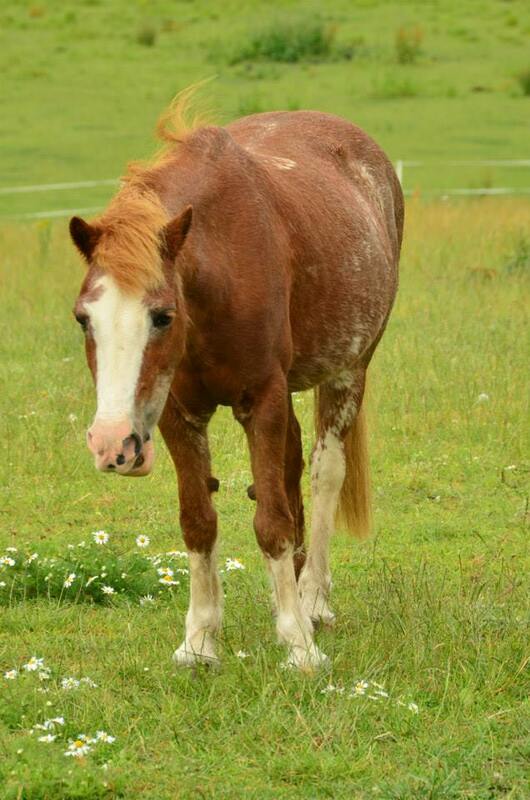 We have an oddball collection of older ponies, including our first pony, Penny, whose now in her mid-thirties. Though still fit as a fiddle and extremely active, at 11.2hh she’s far too small to ride, so is happily retired and lives a ‘Last of the Summer Wine’ existence causing mayhem with her regular escape attempts, jumping 3ft electric fences with no apparent difficulty in her unending search for more grass. She is absolutely a ‘grass is always greener’ girl. 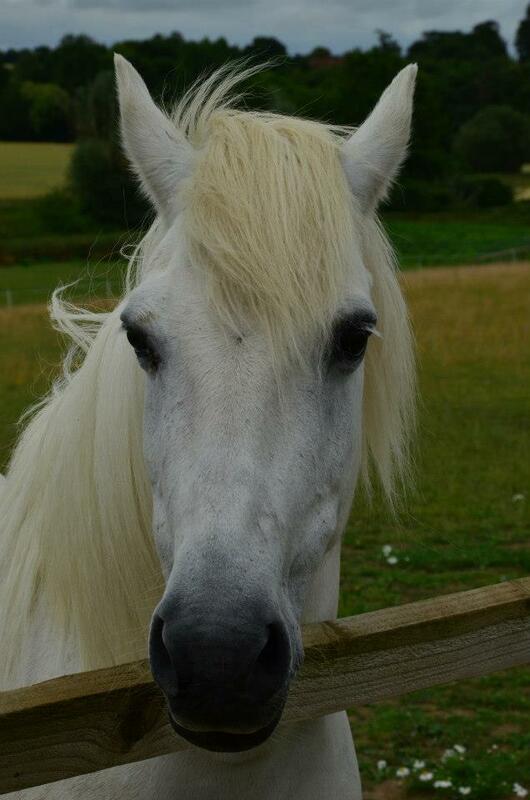 Then there’s Misty, affectionately known as Moo, or Stroppy Drawers depending on what kind of temper she’s in. Moo is Claire’s old pony (and my second pony), a 13.2hh New Forest mare in her mid-twenties. We have no real idea of what happened to her before she came into our lives in 1998, but she was pretty wild to handle and extremely aggressive. Suffice to say that as a very small 13 year old at the time, I’m amazed I’m still here at the grand age of 29! We all have our share of teeth and hoof marks, but thankfully she’s mellowed a lot with age and a lot of kindness, but old habits die hard and we still have to keep a close eye on her. Claire now hacks her, which Moo really enjoys. 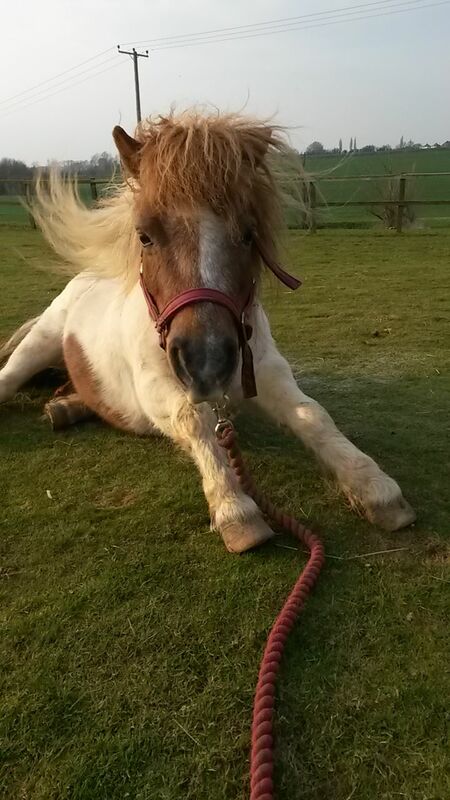 I won’t say too much about young Rosie, other than she’s a very sweet Shetland and not at all stereotypical. She came along as company for Penny and is a worthy mascot. Lastly there’s Saffron, the only one who really does any work around here 😉 She’s my beloved 21 year old Welsh Cob whom I fell in love with over the yard fence when I was 16. She is my world and we have such a bond, she’d do anything I ask. We currently compete BD at prelim level, something I never imagine we’d do. We train classical dressage, very much anti-gadget, the ponies all live out all year in a herd (although Rosie comes in during the day in summer due to laminitis). They’re all unshod, or barefoot and I feel I have learnt so much when transitioning Saf after taking her front shoes off in 2013, I often wax-lyrical about the whole barefoot concept. The way we keep these ponies is in a way that we feel is fundamentally ‘right’ and as natural as possible, given their domestication. I appreciate that not everyone can keep their horses in this way, and I hold absolutely nothing against that. We all need to do the best we can for our beloved equines. I hope you’ll enjoy following our journey. This entry was posted in Uncategorized and tagged barefoot, dressage, introduction, misty, penny, rosie, saffron on June 8, 2015 by Emma. 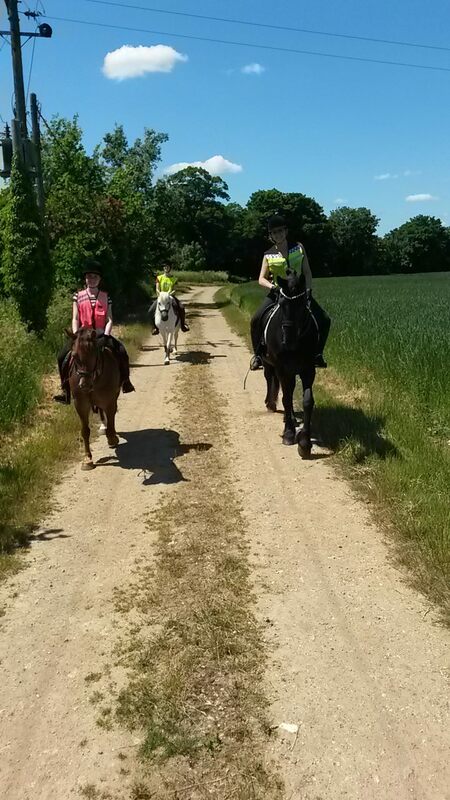 Busy day yesterday, Saf and Mist went for a lovely 5 mile hack with friends – lots of gallopy gallopy… I know I keep going on about it, but I can’t get over how well Saf is getting on barefoot. Some of those field tracks are quite stony – she made her way carefully over the stones, but didn’t slow down at all, just marched on. Back to the yard and off to the co-op to grab a sandwich as we were ravanous by now. Got 3 bales of hay on the way back. I badly needed to school Saf as all i’ve been doing in my time off was hack! So Saf came back out the field after a few hours rest and got tacked up again. She was a total star, warmed up and got straight to work. Some suppling work working low and round, super chilled but bouncy and rhythmical. Did a little more work on shoulder in in walk then finished with some trot/walk/trot transitions which we needed to polish for the test next week. Love her she did it perfectly, the key is to try to replicate it on the day! 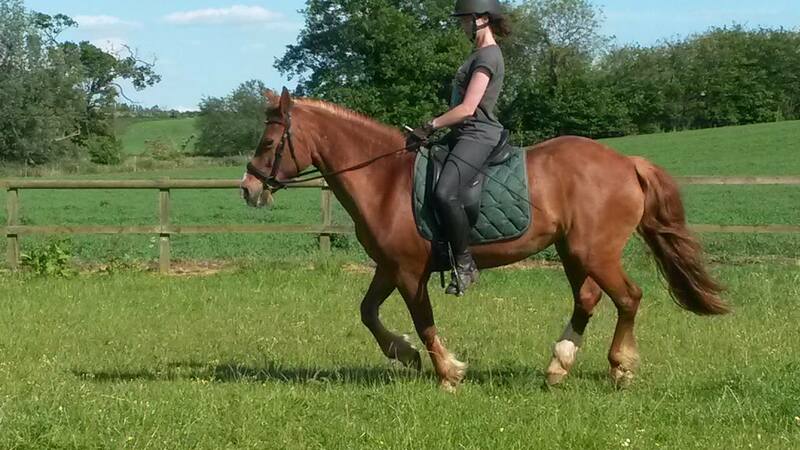 This entry was posted in Training / Schooling and tagged barefoot, classical, dressage, equestrian, hacking, hoof, hooves, horse, photos, riding, training on June 8, 2015 by Emma. 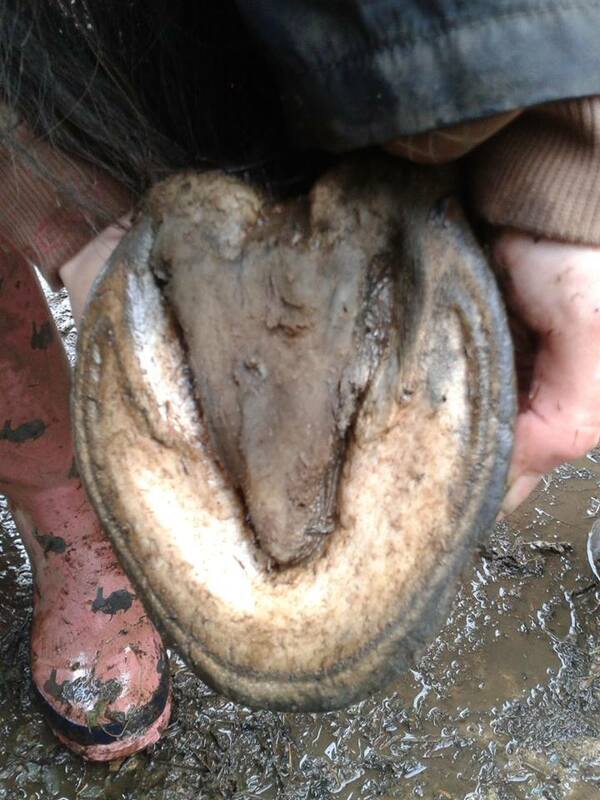 Firstly, I’m no hoof expert, just an interested, if slightly obsessed horse owner. If you’re anything like me, you’ll know that thrush in horses is commonly identifiable as a black, tar-like, revoltingly smelly frog. This is of course true, and something I learned over the years whilst growing up with my own pony. You may know that our four natives are all unshod, it came naturally to 3 of them who were never shod and we never questioned it. Saf has been a little more of a challenge. Learning about barefoot horses is fascinating and I feel like I’ve learned so much about hooves and how they work already. Something I wasn’t aware of in any detail was thrush. 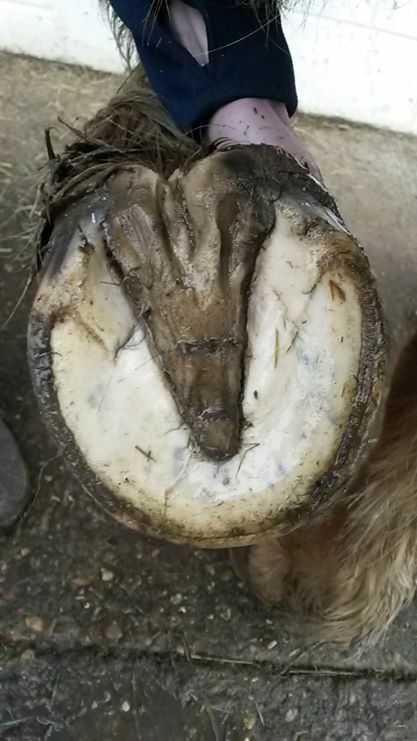 Looking at the underside of Saf’s front hooves here as far as I was concerned the was little or no thrush, certainly can’t see any black goo and they smell fine. However Lucy Priory (Barefoot Trimmer Extraordinaire) saw the photos and commented that there was extensive thrush. Alarmed, I got a tub of Red Horse Field Paste and some soap and water and commenced daily scrubbing and application of said paste. Shall we play spot the difference? Saf’s frogs are noticeably narrower at the heel than these. The thrush is eating away at the frog, and causing discomfort, so she’s less inclined to use the back, shock absorbing, part of her foot. I understand they need stimulation to grow so it’s a vicious circle. The central sulcus (the dent in the middle, back of the frog) is deep and closed. There are many worse ones out there, but compare it to the open, flat ones in the thrush-free photos. All those tatty, ragged parts are a haven for thrush so I’m making sure I’m working the paste right in there. It’s early days yet, but I hope to do an update when I’ve got it under control, and we’ll see what frogs Saf can grow, given the chance! 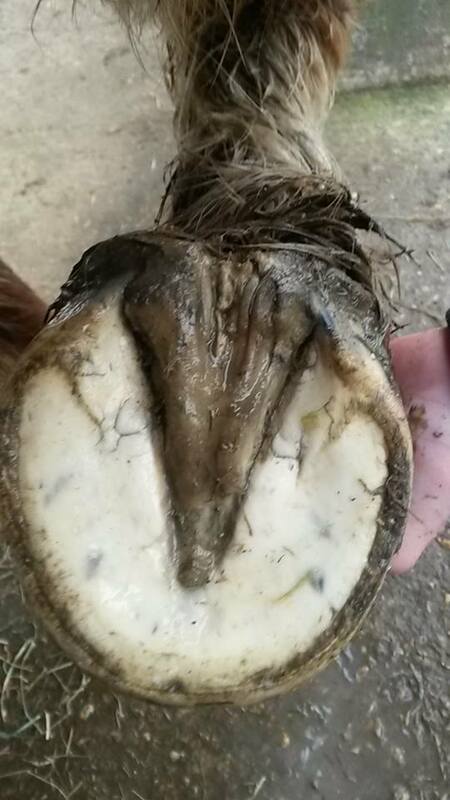 This entry was posted in Horse care, Lifestyle and tagged barefoot, care, hoof, hooves, horse, shoes, thrush on January 21, 2015 by Emma.